Travel to the future to discover what life will be like when cars are flying and robots roam the earth. Click here to play! If you can unlock the secrets that the future holds, you could return with a sizeable fortune! Watch out for the futuristic beauty. This girl acts as a substitute and will replace all other symbols to help you collect more wins. She will also bring in the biggest prize this game has to offer. Spin one to three of her across the pay line and you'll get up to 2500 times your bet. You'll want to marvel at the amazing designs of the future cities. 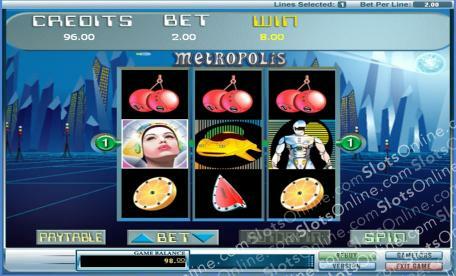 Spin one to three jagged cityscapes and you'll get up to 125 times your bet. Of course, robots are here to help. Spin two to three of these metal men and you'll get up to 40 times your bet. There are plenty of other symbols to help you unlock the fortunes of the future, including flying cars, horses and futuristic fruit. Travel through time in this 3 reel game and spin the right symbols across the single pay line to bring a fabulous fortune back from the future. The future girl acts as a substitute. She will replace all other symbols to help you spin in more wins.